It’s amazing anyone at McLaren has a spare moment right now, what with its seemingly endless run of new supercars. Yet it appears there’s a surprising amount of downtime, give the company’s propensity to play with Lego. 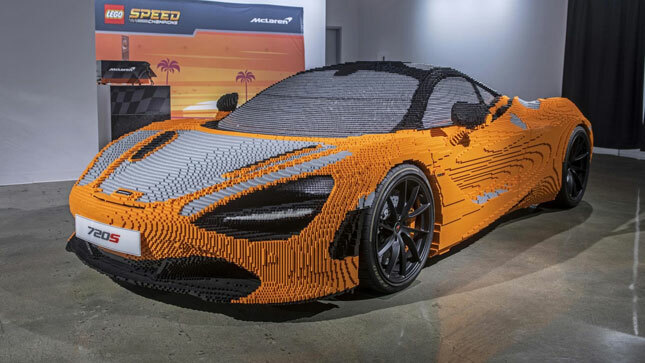 Following last year’s 1:1 scale Lego 720S, displayed at the Goodwood Festival of Speed, is another, for show at the Petersen Automotive Museum in Los Angeles. What’s unclear is whether it’s the same 720S—taken apart and rebuilt in the US—or another, identical kit. We very much suspect the former, but either way, we love the notion of a very long, lavishly illustrated instruction booklet being posted to America, and a box full of orange pieces confusingly tipped over a very large floor. Anyone lucky enough to be visiting the Petersen museum on June 2 got to apply the final few pieces. If you weren’t one of those, it’s on display until August 19. Here's the time-lapse video of last year's build.